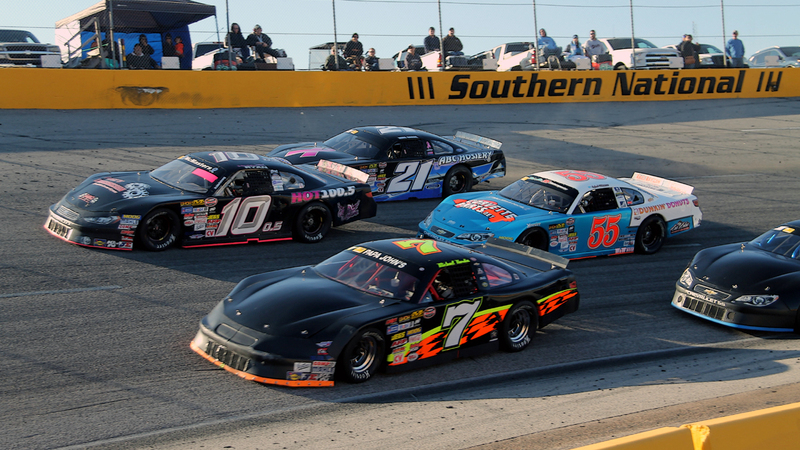 Southern National Motorsports Park’s Thanksgiving Classic has been won by some of Late Model Stock Car racing’s biggest names and by NASCAR stars of the past and present. The first known running of the Thanksgiving Classic was on November 29, 1998 in a 200-lap race won by the King of Late Model Stock Car racing, Philip Morris. Over the years, the event grew and, with it, the prestige. Longtime Southern National competitor and two-time track champion Scott Riggs won the race in 1999 racing for the late Jerry Moody. NASCAR Sprint Cup Series superstar Denny Hamlin, who won the Southern National Motorsports Park track championship in 2003, and four-time track champion Jamey Caudill (1997, 1998, 1999, 2002) are the only drivers with multiple victories in the Thanksgiving Classic. After the 2008 season, Southern National Motorsports Park closed and remained dormant until Michael Diaz and Jerry Brown purchased the facility at an auction for $650,000 on October 7, 2011. The track reopened in 2012 and, in November, the Thanksgiving Classic returned with Greg Edwards scoring the victory in a wild and dramatic feature. The following year’s event, which would be the final time the Late Model Stock Car race would be held on Thanksgiving weekend, was every bit as spectacular where Ronnie Bassett, Jr. scored the victory with a late race bump-and-run on Lee Pulliam. Brayton Haws, who won the CARS Tour championship in 2015, picked up the victory in the 2014 Thanksgiving All-Star Classic after prevailing in a thrilling race-long battle with Todd Gilliland. Gilliland has since gone on to have success in the NASCAR K&N Pro Series and ARCA Racing Series and currently races for Kyle Busch Motorsports in the NASCAR Camping World Truck Series. Lee Pulliam prevailed for his first Thanksgiving Classic triumph in 2015. The 2015 Thanksgiving Classic took just days after his wife, LeAnne, was injured in an automobile accident on her way to work. LeAnne was able to make it and be in attendance for Pulliam's victory. With his win in the Classic, Pulliam completed the Late Model Stock Car "Grand Slam" (wins at Martinsville, Myrtle Beach, Langley and Southern National's headline Late Model Stock Car races). Pulliam is a four-time NASCAR Whelen All-American Series national champion. Pulliam appeared to be on his way to victory again in 2016, but was taken out in a late race crash, paving the road for Tommy Lemons, Jr. to score his first Thanksgiving Classic victory. In 2017, Matt McCall prevailed in the Thanksgiving Classic, getting around Justin Johnson late and driving away for the victory. While the results were disputed, they stood after a lengthy formal review.